VIDEOS: New "Kong: Skull Island" poster and TV ads released by Warner Bros. VIDEOS: New “Kong: Skull Island” poster and TV ads released by Warner Bros. The Reign of Kong continues! After the grand opening of the new E-ticket Skull Island attraction at Universal’s Islands of Adventure last summer, it was only a matter of time before we got a whole new movie to go along with it. 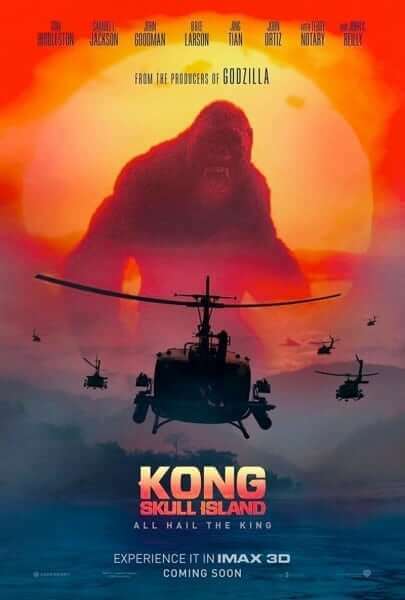 “Kong: Skull Island” went into production about a year and a half ago from Legendary Pictures and Warner Bros. Entertainment, and since then fans of the big ape having been chomping at the bit to get a better sense of what the latest reboot in the long-running King Kong franchise (which got it start way back in 1933 with the original film). This week Warner released a pair of new television spots featuring cast members John Goodman, Tom Hiddleston, Samuel L. Jackson, Brie Larson, and John C. Reilly. And let’s not forget Kong himself. Warner Bros. also revealed a new one-sheet poster for the movie, featuring attack helicopters flying to the titular Skull Island, against a backdrop of a very famous silhouette. “Kong: Skull Island” will be released to theaters nationwide on Friday, March 10th. Tagged:King KongKong: Skull IslandMoviesWarner Bros.